One of the most dangerous, or at least frustrating situations that can happen in normally civil organizations, occurs when renegade rule changers arrive. “Your ‘mistakes’ were unraveling every bipartisan norm our country operated by. Hmm… Mistakes, Norms, Rules. Now there’s a Rule of 3 worth diving into. ‘Tis true that the political process has been on my mind, and in terms of a writer’s research, there are an abundance of very instructive quotes I can curate, tucking them into my commonplace book of findings right now, however they are also apropos to business and workplace culture building. Organizationally, the dysfunction of our federal governance is being revealed in astonishing ways, however that may be the subject of a future blog post. Let’s use the month of February to uncover and dust off any NORMS and RULES you now have in place and audit them with Ho‘omau. Use Ho‘omau to ask yourself, and your team, do we still accept and verify this as one of our norms or rules (and are we clear on the difference between those two states of being) or should we update and/or change it? If you’ve already done this: Bring Constants and Change to Ho‘omau Agreement January 24, 2017, this February exercise will be a natural extension and help you be thorough. If not, bookmark this as next on your agenda. Let’s step back first with a reminder about how our values function. VALUES drive behavior in implicit ways—desirable behavior is implied, but not plainly expressed. In this way, values honor an individual’s conscience when judging the context of a situation, and thus, respect intelligence, with trust that individual’s choices. This is actually the underlying assumption of the entire chapter on Ho‘omau in my book. NORMS come into play when values consistently drive certain behaviors relative to frequently occurring situations. An example would be when a customer’s reaction to one of your products is reliably predictable, and you and your team have therefore been accustomed to handling it in a certain way, be it pointing out an unknown feature, teaching that customer better usage, or something else—all actions which align with Ho‘okipa as your value of customer service, and Mālama as your value of product stewardship. When we make MISTAKES, there is always an atmospheric question at play regarding risk (we have called it The Acid Test of Healthy Workplace Culture)—is it safe enough for me to make this mistake? In a healthy workplace culture, the answer will be yes 95% of the time—the other 5% has to do with workplace safety, and not putting others at risk irresponsibly, and it’s probably where rules should come into play (more on that in a moment). Now, mistakes can also lead to aha! moments. (If you have it, read page 168, 2nd edition of my book: “Mistakes are very, very cool.”) It is very possible for a mistake to become a new norm, again assuming the action taken was still in alignment with your values—it’s an optional outcome, still good, maybe even better, that you hadn’t considered before. 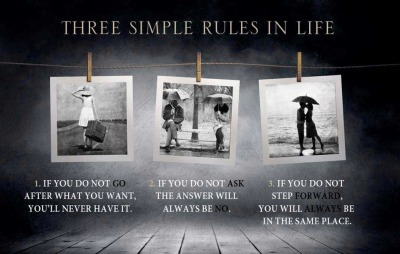 “Three simple rules in life. Initiative. Courage. Self-Reliance. Leadership. They are the urgings of ‘IMI OLA — seeking your best possible life. RULES are explicit where values are not: Explicit means they should be “stated clearly and in detail, leaving no room for confusion or doubt.”—dictionary. Again, safety issues are a good place to see the basics of rule-making, however rules come into play more often than that. Few for instance, will bother to revise Robert’s Rules of Order; we simply outline which of them we’ll adopt and use in our company or organization. In Managing with Aloha culture-building, I’m a fan of First Step Rules. Those are Rules which help steer people on the right path in overwhelming situations, then segue from the explicit to the implicit—they allow people to be more creative in the totality of how a situation will be handled, welcoming more co-authorship and more of an individual touch. Examples of this would be the first step in handling a customer complaint, or the first step when a customer says, “I’d like to speak with your manager.” —They could be a salesman or applicant, and not be complaining at all. Think about this for a moment as a customer. Would you rather be taken care of by someone who follows the rules ‘by the book’ or someone who knows the rules and generally follows them, however is also free to customize solutions to your specific needs? UPDATE: In this week’s newsletter, I cover the famous rules Sister Mary Corita Kent did for her Immaculate Heart College Art Department. I consider them a classic example of First Step Rules. So I hope this helps you with some baseline clarification on mistakes, norms and rules, and sends you on your merry way with some Ho‘omau housecleaning in February. Related Reading: Obviously, I wrote these postings before I wrote this one, so bear with me if I must now correct them with edits for absolute consistency and clarity… Am what I talk about in these postings Norms or Rules, and will they help you audit all corners and lift all rugs in your company?